The past 6 months is like a pause button in between my 12th and 13th rounds of skincare as I was having episodes of food poisoning hence multiple allergic reactions therefore I had to gather set of products that I can utilise to reduce the inflammation for the first few weeks after having reactions and several more gentle, acne-fighting and skin texture-improving products that I continued on using throughout the whole period of skin recovering. Soothing, skin barrier-repairing, hydrating, moisturising, nourishing; these are the keywords that I have been focusing on and only after 6 months, I dare to say that my skin is finally back to its original condition to the point that I finally get to use my Clarisonic brush again. 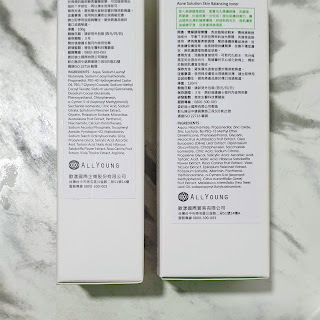 I'm planning to discuss more on the sensitive skin products that I've been using so do stay tuned for that but for now, I'm going to talk about these two products that were sent to me by allyoung Malaysia that I've incorporated into my skincare routine for the past month or so; I'd say these helped me in restoring the oil-water balance especially on my T-zone area and I no longer have breakouts at the same spots at the side of my nose area but before we jump right into the products, let me just talk a little bit on this Taiwan's aesthetic skincare, Swissvita. Swissvita, widely recognized as an aesthetic skincare brand to treat Asian skin concerns utilizing only top notch quality ingredients. Through collaboration with skilled talents from France, Swissvita products were all Swiss-formulated, using signature ingredients such as AC11 and B12 extracts from plants and herbs in the Amazonian forest, these ingredients are widely sought after by international cosmetic manufacturer for the amazing benefits. With the great objectives and beliefs to eliminate plasticizers that can cause breast cancer, Swissvita products are packaged using aluminum tube that not only ensures product quality by retaining the active ingredients but also prevent oxidation. The brand's efficacy through high dose of patented active ingredients and being the only authorized manufacturer of AC-11 Aesthetic skincare products. 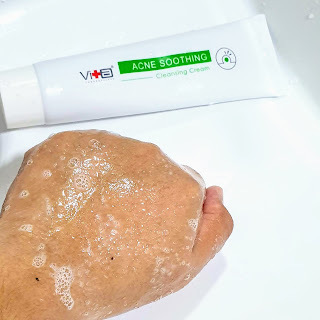 Facial cleanser dedicated for pimpled skin type. Purifying ability which can compete with the auto cleansing brushes. Deep cleansing the pores; washes away impurities and daily grime. Preventing blemishes and pimples from forming by balancing sebum secretion. Removing dead skin cells, blackheads and whiteheads for a brighter look. Reducing the appearances of pores. Aqua, Sodium Lauroyl Glutamate, Sodium Cocoyl Isethionate, Propanediol, PEG-40 Hydrogenated Castor Oil, PEG Glyceryl Cocoate, Sodium Methyl Cocoyl Taurate, Sodium Lauroyl Sarcosinate, Disodium Cocoyl Glutamate, Phenoxyethanol, Chlorphenesin, o-Cymen-5-ol (Isopropyl methylphenol), Saccharide Isomerate, Citric Acid, Sodium Citrate, Epilobium Fleischeri Extract, Glycerin, Potassium Sorbate, Microcitrus Australasica Fruit Extract, Panthenol, Niacinamide, Calcium Pantothenate, Sodium Ascorbyl Phosphate, Tocopheryl Acetate, Pyridoxine HCL, Maltodextrin, Sodium Starch Octenylsuccinate, Silica, Propylene Glycol, Salicylic Acid, Ascorbic Acid, Tartaric Acid, Malic Acid, Hibiscus Sabdariffa Flower Extract, Rosa Canina Fruit Extract, Viola Tricolor Extract, Arginine. Go to CosDNA for ingredients analysis here. Dispense appropriate amount of product onto hands, add water and work into lather. Massage gently onto wet face, focus on the T-zone if necessary. Rinse thoroughly with warm water. Use it daily; morning and night. This product is creamy, less foamy compared to regular cleanser and can be easily rinsed off without causing any redness or irritation. Squeeze out 1cm size of cleanser onto palm (or at the back of your hand like me), lather with water until you get a foamy consistency. Massage gently onto wet face and gently cleanse for 30 seconds. Wash it off with water thoroughly. I've been using this cleanser regularly; alternating with my other gentle cleansers in the morning and I do love how less bubbly the foam is as it doesn't dry out my skin even after massaging my skin thoroughly for 30 seconds as per recommendation. My skin also feeling nice and smooth afterwards. 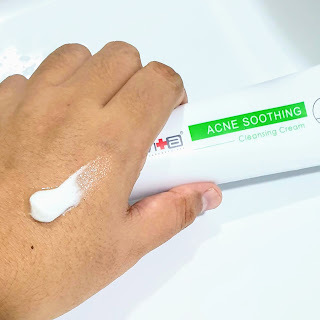 Aqua, Niacinamide, Propanediol, Zinc Oxide, Zinc Lactate, Bis-PEG-15 Methyl Ether Dimethicone, Phenoxyethanol, Glycerin, Microcitrus Australasica Fruit Exract, Olea Europaea (Olive) Leaf Extract, Dipotassium Glycyrrhizate, Chlorphenesin, Saccharide Isomerate, Citric Acid, Sodium Citrate, Propylene Glycol, Salicylic Acid, Ascorbic Acid, Tartaric Acid, Malic Acid, Hibiscus Sabdariffa Flower Extract, Rosa Canina Fruit Extract, Viola Tricolor Extract, Allantoin, Panthenol, Triethanolamine, o-Cymen-5-ol (Isopropyl methylphenol), Citrus Aurantifolia (Lime) Fruit Extract, Melaleuca Alternifolia (Tea Tree) Leaf Oil, Iodopropynyl Butylcarbamate. Shake the bottle well to mix the double layer; toner with the powder that's sitting at the bottom of the bottle then apply to cleansed face. Pour an appropriate amount on cotton pad or palm, gently pat it on your face until fully absorbed. Use it daily; morning and night. 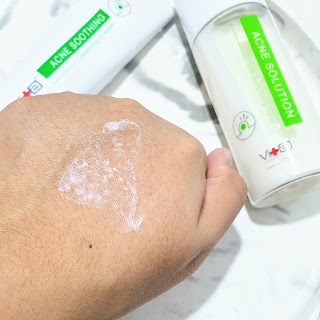 This toner has lightweight consistency and I've been using this toner as first step after cleansing step in my morning skincare routine and it does help to inhibit sebum overproduction and prevent blemishes at the same spot at both side of my nose area. It doesn't really has a scent to it; maybe a faint tea tree oil scent but I hardly noticed it. Although some of you might consider on using this toner alone for your whole facial area, I still find this toner a bit lacking in terms of moisture so I usually apply this toner just on my T-zone area and opting for more moisturising toner for my drier U-zone area. 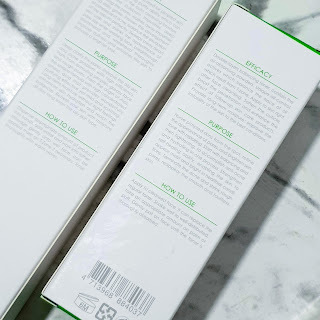 As you can see, the box is simply designed; I'd take it as the brand intends to focus more on the product itself, them being their ultimate acne solution skincare products. Do note that these products are to be used within 6 months after opening. There's English product descriptions at the back and side of the boxes which are nice considering the brand is originating from Taiwan. The Expiry dates are at the bottom of the box and on the bottle and aluminium tube itself which is something I'd appreciate as I no longer hoard products packaging. 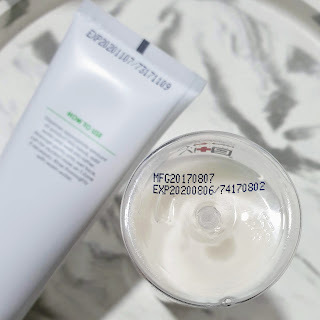 Although I don't really like the opening of the aluminium tube of the facial cleanser that much; looks like toothpaste IMHO but I'm gonna look past it as the consistency of the cleanser is creamy so it's still easy to dispense it. The cap for the toner is considered nice as the product doesn't spill or anything. The hole isn't too big either so it's easy to control the amount of the toner itself. 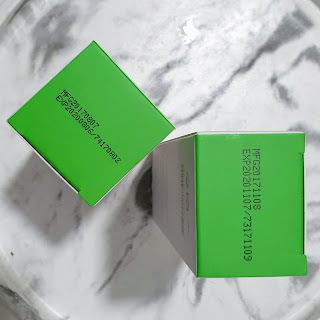 I have got to say that it's been a long time since I have any product with lots of astringent in it as for the past 2 years, I'm all about hydrating, moisturising products as part of my anti-aging skincare routine but with the allergic reactions I was having that made my skin went crazy with dryness which resulted in super oily T-zone, rough flaky texture and some redness, I'm glad that I got to try these gentle, non-drying (as I would expect from lots of acne-related skincare products) and blemish-preventing products from Swissvita. As of end of this month of November, I'm fully back to my normal to oily skin condition; now focusing more on reducing dark spots and pigmentation caused but above all, I'm indulging myself more in moisturising products as I'm about to venture in exfoliating acid toner. Thank you so much to allyoung Malaysia and Swissvita Malaysia for sending these products to me at such a perfect timing! Swissvita Acne Solution Cleansing Cream and Skin Balancing Toner. Click the image above to purchase. Disclaimer: Links provided are non-affiliated and solely for your convenience. The products were sent to me for review purposes and all opinions here are based on my personal use of the products. A month ago, I've received another Althea Angel blogger mail and this time I've received an opportunity to personally tried and tested their recently launched product for their in-house brand; a new addition to their Althea Exclusives, Althea Petal Velvet Sunaway SPF50+ PA++++. Indeed, it's a new sister to my current favourite finishing powder which is the Petal Velvet Powder that are available in 3 different variants as of this year. You guys already know that I'm huge on sun protection and sunscreen is the last step for my morning skincare routine; the most important step for skin protection against the sun UV rays. I would say that no matter how much you invest your time and effort to do your skincare through mornings and nights, all those treatments will go down the drain if you do not add suitable sunscreen product to your AM routine and equally important to the first application in the morning (assuming you're like me who always go out to work on weekdays and outdoor activities on weekends) is the reapplication of sunscreen throughout the day. As someone who have normal to oily (T-zone) skin with dehydrated U-zone area, I'm always looking for sunscreen that hydrates and gives me slightly matte finish. I won't mind slight white cast for that toned-up look as long as my overall complexion won't appear ghostly i.e. overly white for medium skin tone. As for the formula, I'm into sunscreens that contain chemical filters these days (notable ingredients oxybenzone, avobenzone, octisalate, octocrylene, homosalate and octinoxate) but I've been using physical sunscreens up to last year (notable ingredients being zinc oxide and/or titanium dioxide) so I don't mind using either or better, hybrid of the two group of ingredients. Now, let's go into some details on this product first. A non-chemical UV filter (builds up sunscreen filter on the surface of the skin and scatters UV light) formula with a light, fluid texture to protect the skin from both UVA and UVB rays. Controls excessive sebum on the skin with a micro powder system while hyaluronic acid ensures the skin is kept hydrated throughout the day. Micro particles absorb sebum and excess oil from the skin to give a light, velvety finish. As you apply the Sunaway, hyaluronic acid replenishes moisture and deeply hydrates the skin. Applies evenly and smoothly onto the skin without leaving a white cast behind due to an advanced non-chemical UV filter with a more transparent formula. Contains Damask Rose extracts to moisturise and smoothen the skin. Damask rose has a natural nanomolecular composition that is rich in vitamins to penetrate deep into the skin, soothing sensitives and strengthening it for a radiant glow. 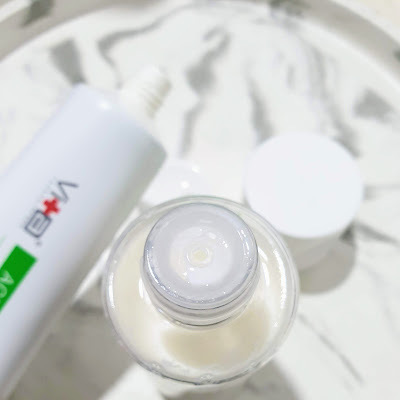 Contains mineral ingredients; titanium dioxide and zinc oxide that work by sitting on top of the skin to deflect and scatter UV rays away from the skin. Now, let's talk about the packaging! The sunscreen came within the cute pink box that is in similar design to their Althea box used for delivery. There's Korean product description printed at the back of the box so if you still need further information in English, I have provide the link at the end of this post for your convenient. There's product batch and expiry date printed at the smaller side of the box and again at the bottom of the bottle itself. The format is YYYYMMDD. As you can see above, the sunscreen came in a small bottle in opaque white with pink screw cap. There's simple product description at the back as well. Do note that you'll be needing to shake the bottle well before usage especially when left unused for awhile. Like most sunscreen bottles, this one too comes with a small opening to easily dispense the product to avoid excessive amount. Upon first application, the consistency is indeed lightweight, feels fresh on skin and doesn't leave much white cast on me. The scent is rosy and nice; not overpowering or linger at all. This sunscreen does last quite well throughout all morning on its own and even when used under base makeup e.g. foundation, the finishing isn't affected at all and they work nice and even. Although I've only used this sunscreen like few times under Fenty Pro Filt'r Soft Matte Longwear Foundation and its primer sister but they work well together. I usually go for tone-up sunscreens for first sunscreen application in the morning but I do use this sunscreen on top of tone-up creams or another Althea Exclusive; Althea Fixer Cream for no-makeup makeup look for almost everyday during the past month. Whenever I feel like my skin needs hydration boost, I'd incorporate simple hydrating or moisturising sheet mask in my skincare routine but of course, if you're someone who consider yourself as beginner in skincare or just want to go for #skincarediet instead of doing a typical 10-step Korean skincare routine, you can try these Althea Exclusives that include from cleansers to moisturisers to fit your daily skin needs. If you're wondering how to reapply your sunscreen throughout the day, it's pretty simple! 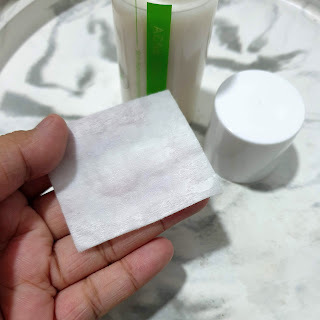 Just dab your face with blotting paper for excess oil or facial tissues for sweat, then to just freshen up your skin, spray your face with hydrating facial mist evenly then after a few minutes, you can just apply the sunscreen on your facial area using clean fingers or air puffs by tapping motions for even application. I have also been pairing the sunscreen with its powder sisters most of the time for that smooth, velvety finish that last all day long. I know it's fun to use different products from different brands most of the time but I've got to say that I do enjoy using Althea Exclusives together and I definitely think it's because they're designed to complement each other. I'm a huge fan of continuity not only in design but also in my skincare products. Oh, I can't wait to share with you guys about the latest launch from the brand; an exfoliator that transforms from a clay to a whipped cream lather. Definitely something I've never tried before. Overall, I would say that this sunscreen is a great product that works well with my skin. If you're on a drier side but still would love to have slightly matte finish then you could use medium to light moisturiser underneath this sunscreen as that's what I do for my dehydrated U-zone area. I know, combination skin is so complicated especially after I hit the big 3-0 this year. Not only I need to cater my oily T-zone but also those flaky areas around lower cheeks to my jawline. I just found an intense cream for these area so I'll update you guys on that later. You can purchase the sunscreen at individual price of RM43 or in a set of this sunscreen and any of the Powder sister with 10% discount (no code necessary) at only RM53.10 (Retail Price at RM59). If you're new to Althea and planning to purchase more than RM150, use my link (click here!) for 20% discount off your first purchase! So I guess that's all from me! If you have already tried this sunscreen, do let me know what you think or if you haven't, tell me your favourite sunscreen that you'd like me to try next by leaving comments down below. Disclaimer: Links provided are non-affiliated. The products were sent to me for review purposes and all opinions here are based on my personal use of the products. 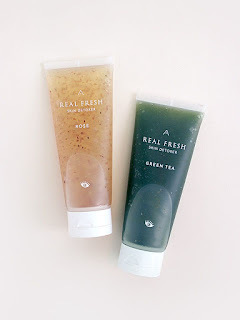 Yesterday, I've received another blogger mail as I'm part of Althea's Beauty Ambassador Community; Althea Angels and this time it's about a product that I have never encountered a similar product to it; clay mask that turns into bubble mask! In my 5 years K-Beauty journey, I've tried sheet mask that bubbles up, bubble facial cleansers and I think the most similar to this product is a peeling gel that bubbles up but the result was slightly above average when it comes to smoothing out my skin so I didn't repurchased it or similar product as I'm not that impressed. As my U-zone area is still sensitive due to the whole allergic reactions I had few months ago, I'll be testing this product on my cheek towards my T-zone area to see how this work on my Instagram Stories later so do stay tuned for that. 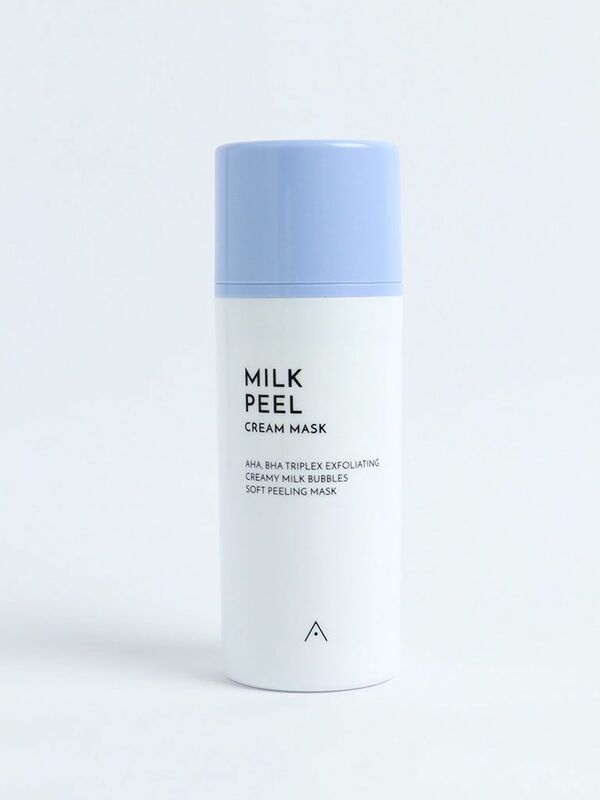 This product is already available to purchase on Althea; link is down below and if you're new to Althea and planning to purchase more than RM150, use my link (click here!) for 20% discount off your first purchase! 10-Second Mask to Cleanser. No More Excuse to Rough, Flaky Skin! Get It Beauty, being South Korea's no. 1 beauty show having constantly introduces new trends and provides resourceful information relating to beauty. From verification by scientific testing to providing the chances to enjoy the beauty products in person; Better Girls trying the products during the program, this beauty show offers various and broad beauty experiences. I personally am following some of their popular hashtags on Instagram (although in Hangul) just to have overall perspectives on what's currently trending in the land of beauty products especially in Seoul. Making beauty as the main concept in approaching one's lifestyle which heavily surrounds around health and beauty products, Get It Beauty creates a new beauty ritual with Althea; a platform where I've been enjoying lots of benefits like getting my beauty essentials at affordable prices, occasional sales and promotions especially on beauty favourites (Son&Park Beauty Water is currently on 1+1 deal) and being part of their Beauty Ambassador program i.e Althea Angels where I've been receiving their latest in-house products that are exclusively available on their website; the first ones being the Real Fresh Skin Detoxer in Rose and Green Tea that I've previously reviewed here in this blog. Basically, these are 10-second mask-to-cleanser skincare products and I've personally never encountered any similar product to it. 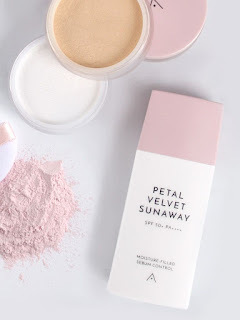 Judging how well-received these products not only among us Althea Angels but also beauty enthusiasts around, I'd say it's been a successful collaboration and did you know that K-pop star EXID's Jeonghwa is also a fan of the product? Check out the video below! As you can see in the above video, these products are easy to use with minimal time needed and instant great results in terms of skin texture improvement and overall complexion; perfect for those of you (of course, myself as well) who are always rushing in the morning or evening, struggling with 10-step skincare routine. At this this point of time, I'm about to finish my first set of duo so here comes to good news! You can purchase them in a set with 10% discount (no code necessary) and if you're new to Althea and planning to purchase more than RM150, use my link (click here!) for 20% discount off your first purchase! So I guess that's all from me! Let me know your thoughts on using them by leaving comments down below. If you haven't, this is the chance to get it! Don't say I bojio!